As you may have heard, the Regional District is having difficulty securing a location for the new regional composting site. This is frustrating because a regional composting site is intended to do two things: (a) avoid significant costs and (b) reduce our environmental impact. I certainly understand that people don’t want a waste-related facility anywhere near them. But, if we are to realize the economic and environmental benefits of such a facility, it has to be located somewhere. So rather than hosting a screaming contest (to see who can muster the loudest and most angry opposition to the site), I am in favor of making the decision based on more objective technical and economic criteria. People are going to scream no matter what. But we have to make the decision that it is the long-term interest of the broader community. The City of Penticton and, to a lesser extent, the District of Summerland and Okanagan Falls currently generate sludge from their sewage treatment plants. Those of us with septic systems contribute to this pile whenever we pump our septic tanks since the pumping companies are now required to dump at a treatment plant. So everyone in the regional district contributes to the sludge problem. Every single one of us. Sewage is nasty in and of itself, but also brings other dangers. For example, the sludge may contain heavy metals from fixtures, plumbing, and other sources. It may also contain pharmaceutical residues and endocrine disruptors, which are poorly understood but potentially harmful. So how are these dangers dealt with now? They aren’t. The City of Penticton composts its sewage sludge on a small portion of the Campbell Mountain Landfill. The wet sludge sits on the bare ground, so any leachate percolates down into the soil and ultimately the Okanagan basin. The District of Summerland does much the same thing with its sewage sludge. It composts it on bare land at the Summerland landfill. Summerland’s main water intake is upstream of the landfill; however, its unlined water reservoir is nearby (another landfill siting mistake?). A hydrologist might argue that leachate is bound to be pushed away from the reservoir by hydraulic pressure. Even so, leachate near a reservoir can't be a good thing. One sensible way to compost sewage sludge is to put it on an impermeable surface (concrete or perhaps a membrane) and collect the leachate. Why isn’t this done by Penticton and Summerland? Because big concrete pads with roofs, odor control, and drainage systems cost real money. Hence the push for a single regional site for sewage sludge—a site that permits economies of scale to be achieved. If a regional compost site is not constructed, these municipalities will likely continue with the status quo, which is to put sewage sludge on dirt near drinking water supplies. This is one of the reasons Summerland Mayor Peter Waterman has been an outspoken proponent of locating a state-of-the-art sludge treatment facility at the Summerland landfill: a proper regional facility solves a problem through collective investment that Summerland on its own has been unable to solve. A note on terminology: Once the sewage sludge has composted at high temperature and then cured, it ceases to be “sewage sludge” and becomes “biosolids”. Biosolids are deemed to be safe, even for application on gardens because the sewage pathogens are killed and endocrine disrupters are broken down (or not) during the composting and curing processes. Indeed, Kelowna has had great success selling its biosolids-based Ogo Grow product to local farmers. On the other hand, some people have concerns about pharmaceutical and heavy metal residues in the cured biosolids. RDOS staff currently believes that yard and food waste compost (see below) will ultimately supplant biosolids as agricultural compost due to this uncertainty. Reduce methane created by anaerobic decomposition of organic waste. Some have asked: Why not just capture the methane gas and use it to heat houses and do all sorts of awesome things? Methane gas capture is feasible if (a) the landfill is designed from the bottom up to support it and (b) the volume of waste evolves a sufficient quantity of methane to offset the large capital costs of the capture system. Neither of these conditions is even close to being met at Campbell Mountain Landfill. Extend the life of the landfill as long as possible. Hopefully the economics and politics of this are self-evident. 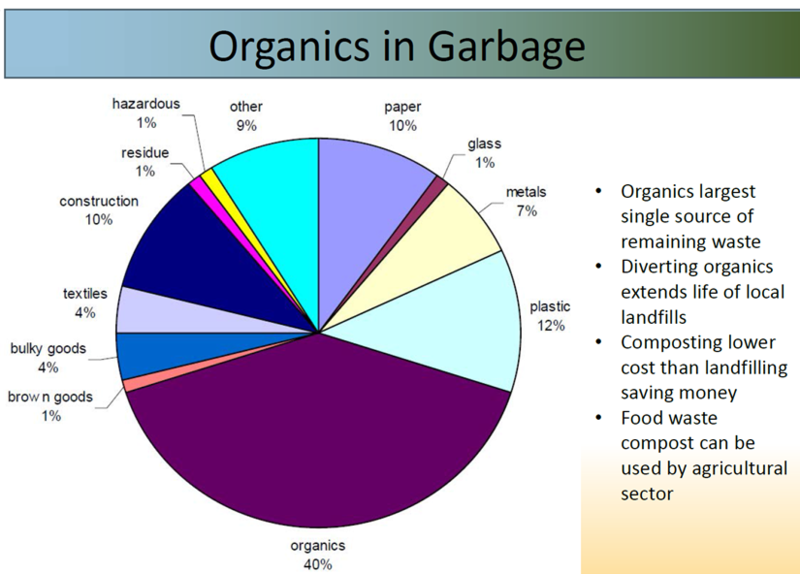 As the slide below shows, organics are by far the largest source of waste in our landfills. The problem with yard waste pick-up and small-scale composting is that a large stream of organic material still ends up the landfill—chicken bones, leftover lasagna, commercial food waste, and so on. Most large urban centers in British Columbia already have food waste collection. Yes, a green pail full of food waste is disgusting, but if we can collect is separately, we can compost it instead of adding it to the landfill. Unfortunately, general food waste is not fun to compost. You know this if you have ever accidentally added protein to your compost bin. It stinks more than fruit and vegetable waste and attracts maggots and other critters. In addition, food waste typically contains salts. Thus we cannot compost food waste using our existing compost facilities and techniques. We will need enclosure, odor mitigation, and leachate collection. Again, this means a building with a concrete floor, air filters, and so on. It is trucked away as a soil amendment. Fortunately, the final cured product is much lighter and less voluminous than the original organic material. This round-trip lifecycle has an important implication for the compost site: We want it near farmers. Some residents have suggested putting the regional compost site in a very remote location. But recognize that this entails significant trucking costs if the finished compost is hauled back to farming and gardening areas. A related issue is the existing methane output of the Campbell Mountain Landfill. Various estimates suggest that Campbell Mountain generates enough methane to trigger the Province of BC’s landfill gas regulations. Accordingly, we have been told by the province that we must do something about the methane. This is not optional. The obvious first step in methane reduction is to stop putting uncessary organic material in the hole (hence the importance of the new food waste composting initiative described above). The second step is to either capture or convert the methane that is bubbling up to the landfill surface. As noted previously, retrofitting gas capture on a landfill not designed for gas capture it is a bit like installing central air conditioning in an old house with no ductwork: It is theoretically possible but practically foolish. The number being bandied around is $20M, plus no guarantee that we will not end up with a landfill fire. A cheaper and safer alternative, which the RDOS is currently piloting, is biocover. 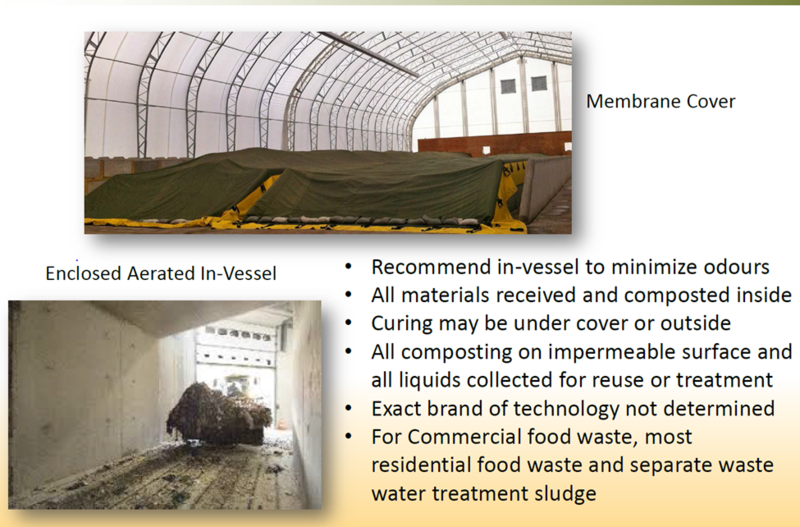 Biocover is a thick blanket of composted organic material on top of the closed portion of the landfill. As the landfill gasses bubble up, they interact with the biocover and the atmosphere and the some portion of the methane is converted into carbon dioxide and water. Assuming the pilot studies show enough methane conversion to satisfy the province and release the RDOS from the obligation of installing mechanical gas capture, the immediate challenge is finding a reliable source of organic material to create and maintain the thick blanket. Metro Vancouver has offered to provide as much of its cured biosolids as we want—they will even pay us to take it. The Central Okanagan Regional District is also looking for someone to take their sewage compost. However, as noted previously, we already have our own local sources of biosolids. Using these biosolids as biocover for Campbell Mountain Landfill allows us to solve several problems at once. Two levels of covering for odor control: An outer skin (e.g., tensioned fabric) plus interior gore membrane covers (see photo below). Close to population and farming. Two-way trucking of raw organics (inbound) and compost and biosolids (outbound) is a source of cost as well as pollution. In practice, this means the site should be close to the Summerland-Penticton-Okanagan Falls corridor. Large enough to serve as a regional site. The infrastructure for leachate collection and odor control is expensive (which is why none of our current compost or biosolid composting sites have it). Economies of scale make a single large site preferable to multiple smaller sites. Away from people. Site visits to a state-of-the art composting facility in the Fraser Valley demonstrate that these facilities can have very low odor impact (though, to be fair: how would you know in the Fraser Valley?). In general, however, the idea is to keep this industrial-looking facility away from people. Unfortunately, this is in direct conflict with the requirement above that the facility be close to the sources of its inputs and destinations of its outputs. So a balance needs to be struck. The two most promising sites selected by RDOS staff and consultants during a seven-year search process are PIB land in Marron Valley and the existing Summerland landfill. One advantage of the Marron Valley site is that it strikes a good balance between highway access and being in the middle of nowhere. Its main disadvantage is that, apart from the very large auto wrecking yard beside it, it is in a pristine valley. The primary advantage of the Summerland landfill site is that it is already at a landfill! There is no possibility of mucking up a pristine valley or surprising the neighbors. Unfortunately, both of these sites are apparently off the table. I was absent from the meeting at which the RDOS board decided to drop Marron Valley from the short list. Summerland council has ruled out any further consideration of its landfill. So now the focus shifts to large private properties. The obvious problem with private sites is that the owners have to be interested to proceed. Numerous residents have contacted me and other RDOS directors with good suggestions. However, after a seven-year search, most of the obvious alternatives have already been identified and explored. For example, the former Weyerhaeuser site in Okanagan Falls has been suggested as a possible alternative. RDOS staff have reached out to the owners of the Weyerhaeuser site several times in the past but there is apparently little interest on the owner's side [*correction below]. This does not surprise me one bit. After all, you would have to be delusional to think that the people around the (formerly industrial) Weyerhaeuser site would allow a compost site to go forward without making at least as much noise as the folks in Summerland and Marron Valley. In other words, the Weyerhaeuser site (or any other site you can think of) does nothing to solve the paralyzing political problem of NIMBYism. Every single site will have its own NIMBYs. More critically, according to RDOS staff, the Weyerhaeuser site is less desirable than the shortlisted sites on several dimensions, not least the proximity to high-end wineries. Brenda Mines has also been suggested. Keep in mind, however, that we are talking about compost, not radioactive waste. The compost—even the biosolids—have uses back here in the South Okanagan and Similkameen. So even if there was interest from the mine owner and the Central Okanagan Regional District (there is not), the trucking costs would sink the cost-benefit analysis. Area D Director Tom Siddon suggested—perhaps facetiously—that we locate the composting facility on the West Bench. I personally would not be opposed to replacing the asphalt plant across the street from my house with a compost facility. It could only be an improvement. More realistically, there are some large private properties in Area F along the road between Summerland and Faulder. The obvious problem—at least I hope it is obvious—is that these sites would require routing the trucks past the front gate of the Summerland landfill. Thus, a private property solution in that part of Area F would stick Summerland with all of the truck-related costs of the Summerland landfill option without any of the benefits to the municipality (revenue, capital upgrades, control, and so on). I can't imagine this would go over well. As I see it, the RDOS has to get the composting facility back on track. And there is real urgency here. We need to start diverting large amounts of food waste from Campbell Mountain Landfill and convince the Province of BC we will get a grip on the methane problem before it mandates gas capture. But we also have the problem of our own sewage sludge sitting on the dirt and leaking into our groundwater. It is hard to imagine this being permitted to continue for much longer. So the question is: Do we want to get in front of this problem on our own terms or wait for someone to tell us what to do? A political stalemate on this issue is not victory. It is an economic and environmental failure for all of us. Why not compost at Campbell Mountain? From Cam Baughen at the RDOS: [The RDOS] has not reached out to the owner of the Weyerhaeuser site because it was originally slated for housing. Odour would be an even greater issue than Marron Valley as it would be much closer to homes. I have been asked about the "state of the art" composting facility referenced above. Several local politicians from the RDOS and District of Summerland visited the Net Zero Waste facility in Abbostford (map) in September. My thinking is that the sewage sludge should be composted at the Campbell Mountain site. If this is where it is to go after it is treated, then look at the savings in trucking costs for the next hundred to two hundred years. I'm not sure if the food waste can be treated separately but we do have other sites where this could be done that are owned by RDOS. If both have to be done at the same site then lets look at the extra cost of doing the site at Campbell Mountain and factor in the trucking cost savings and not having to pay out a land lease for the next 100 years and more. I have add a long-ish response as a follow-on to the main post. We are all entitled to our own opinions but not our own facts. I have used data presented by the RDOS, unfortunately they do not show their methodology. (I am not able to attach to this blog the spread sheet showing these numbers). If you want to use the NIMBY argument then let's also talk about "not putting our garbage in my neighbors backyard"
The cost of a full regional Facility versus five separate facilities doesn't significantly benefit residents of Penticton, Keremeos, and areas B,D,E,F,G. The capital cost per individual for a separate facility is between an additional $28 to an actual savings of $18. The extra operating cost per person is just $4/year for a separate facility over the cost of a regional facility. On the other hand the other regions of the RDOS will benefit greatly from a regional facility versus paying for their own separate facility. For example, Summerland's capital cost for a separate facility is between $474 and $508 per person and an annual operating cost of $52 per person. A regional facility would cost Summerland residents a capital cost of $200 to $287 per person and their portion of annual operating costs would be $21. Therefore the individual Summerland tax payer will save between $221 and $274 in capital costs and $31 per year on operating costs by having a regional facility versus building their own facility. These numbers are not mine, they are from the RDOS. Secondly, data also from the RDOS, the price per tonne figures show that the cost of a regional facility would cost $65 to $80 but the cost per ton for Penticton, Keremeos, B,D,E,F,G to have their own facility would cost $72 to $75 per tonne. In other words the costs could be from as much as $10 per ton extra to $8 per ton LESS by having a separate facility. On the other hand Summerland would have to pay as much as ($148-$65) $83 per ton more for their own facility versus a regional facility. Again, they should have the facility in Summerland and not try to save their own tax payers money on the backs of Marron Valley residents. The RDOS presentation Ken is referring to is in the Feb 1st agenda package (starting on p. 53). The point of the presentation is to answer a question that has come up in the boardroom a few times: How much more espensive would it be to build a whole bunch of little composting sites rather than one large regional site? Clearly, this is bound to be a very rough analysis. The RDOS has not done nearly as much work to cost out five local composting sites compared to the regional site. So what RDOS staff has done is supplied a range of estimates for each location. Here we see that we should expect capital costs for multiple sites to be $7M or so higher and operations costs to be $1.3M per year higher. To get a full lifecycle view of this, we need to compute present value (PV) and/or equivalent annual cost (EAC). I have converted operations costs to PV using a discount rate of 6%, a term of 20 years, and an inflation rate of 2% (for a real interest rate of 3.9%). My take-away from this is that the total lifecycle cost of multiple sites is about $24M more than a single regional site. Annually, this translates to a difference of about $1.8M (on a total RDOS solid waste budget of ~$6M). So I would agree with RDOS staff's simple conclusion that a single site costs less. And the difference is large enough to matter. * The two-value estimates provided by RDOS staff correspond to the "best-case" and "worst-case" costs. According to these estimates, the capital cost for the regional compost site is unlikely to fall below the best-case estimate of $16M and equally unlikely to cost more than the worst-case estimate of $23M. But best-case and worst-case are extremes. The "most-likely" cost is somewhere in between. So say the probabilty of the worst-case capital cost for the regional compost site ($23M) is 5%. And say that the probabilty of the best-case capital cost for the five satellite sites ($25.3M) is also 5%. The absolute difference between the worst-case for the regional site and the best case for the satellite sites is quite small--$2.3M or 10%. However, the probablity of getting these two extreme outcomes is 0.05 x 0.05 = 0.0025. Michael, my point wasn’t to argue that separate sites would be less expensive than a single regional site. The RDOS staff estimates obviously confirm that a regional facility would overall be less expensive than five individual sites……OVERALL. However, because of population densities and scaling differences, some sites will benefit cost wise more than others. In my analysis of the RDOS data, I showed that Penticton, Keremeos, areas B,D,E,F,G as a whole will benefit the least from a regional facility versus having their own facility while Summerland will benefit a great deal more having a regional facility rather than their own facility. This is simply another of many compelling reasons that have previously been documented that the Summerland Land Fill is the logical site for a regional facility. Sure, but the elected council of the District of Summerland has already decided that a regional compost site will not be located at the Summerland landfill. That is a District of Summerland decision, not an RDOS decision. I assume the District of Summerland has a plan to deal with its own sewage sludge leachate. As it now stands, that leachate has the potential to pollute all downstream water sources in the Okanagan basin, including the water my family drinks.